...was in 1980. Wait, if the Transformers didn't come out until September 1984, then how could Megatron make his first appearance in 1980? 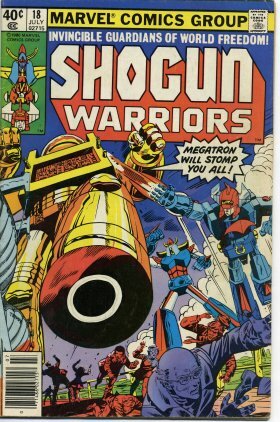 Easy, Marvel Comics already had the name "Megatron" lying around from this robot, the original Megatron! A few years later, when they were commissioned by Hasbro to create the whole mythology for the Transformers (and to, you know, name them), they simply dusted off the name Megatron. And here you thought Megatron the Decepticon was the first Megatron. IF CHUCK NORRIS HAD A DIME FOR EVERYONE HE DIDN'T KILL WITH ONE OF HIS ROUNDHOUSE KICKS, CHUCK WOULD HAVE NO DIMES! Spooky... Megatron's always shape-shifting from one form to another. I know whats up with that he is like danzig fans the cant choose one color for their hair... you know what im saying........ i mean he changes form as much as the average human being changes their underwear! Well let's see... Bill, am I missing any? 50 posts! Yay, I'm a sergeant! Geez Louise! You post more than I do! Yet, I am still the Admin and as such, I will forever outrank you. It's time for a change! I am the leader of the future! GoliathAssassin wrote: It's time for a change! I am the leader of the future! That's not what megatron would hae said, Bill. You left a classic Starscream line hangin!